Dr. Hedge graduated from Western University of Health Sciences in 2009 and completed a three-year shelter medicine residency program at the Oregon Humane Society (a program she helped design) in 2013. During her residency, Dr. Hedge performed over 8,000 dog, cat and rabbit spay/neuter surgeries as well as other surgical procedures ranging from soft tissue surgery to orthopedic and dental procedures in canine, feline, small mammal and avian patients. She also taught surgery and medicine to fourth-year veterinary students from Oregon State, performed shelter consultations and was involved in several large-scale animal cruelty cases including treating animal victims, writing up medical investigations reports and testifying in court. Dr. Hedge has also been an active veterinary volunteer for animal protection groups, including volunteering with the Oregon State University IVSA on a trip to Nicaragua to provide preventative veterinary care and spay/neuter surgery, participating in two RAVS trips, one in Washington state and the other in the Dominican Republic, volunteering for monthly free veterinary clinics for animals of the homeless hosted by the Portland Animal Welfare Team, and serving as a volunteer veterinary surgeon for the Feral Cat Coalition of Oregon. Dr. Hedge received her Master's in Public Health with the University of Minnesota in 2013 and board certification in Veterinary Preventive Medicine in 2014. She became board certified in Shelter Medicine in 2017. She is currently an Assistant Professor of Shelter Medicine and Western University of Health Sciences College of Veterinary Medicine, where she is building shelter medicine training programs. Her professional interests include surgery, veterinary forensic medicine and community cat management. In addition to several scientific published articles, Dr. Hedge also wrote two articles for the HSVMA monthly newsletter. 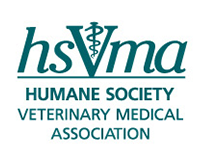 In the first, entitled, "Embracing Change in the Veterinary Profession," she advocates for the veterinary profession to be more involved in speaking out on animal welfare issues. Her second article, "Surgery Not Required: Updates from the 5th International Symposium on Non-Surgical Methods of Pet Population Control," explores advances in non-surgical sterilization methods.